Olivia finished all scheduled procedures and was discharged just a few minutes ago. We now head to see her cardiologist Dr. Natarajan. She is super cranky and cant really walk without crashing into things. We talked to the cardiologist over the mri study. He recommended we continue to watch one of her pulmonary arteries that goes under her aortic arch. It is normal to be small but hers is one the small side of small. He also said her aortic arch is on the narrow side but with all of the sutures in her veins/arteries from previous surgeries we will have to watch to see if it will grow. The rest of the info from the mri we will get in two/three days. Her echo results we will discuss at this appointment coming up. She has to see someone in ent in 4 weeks. 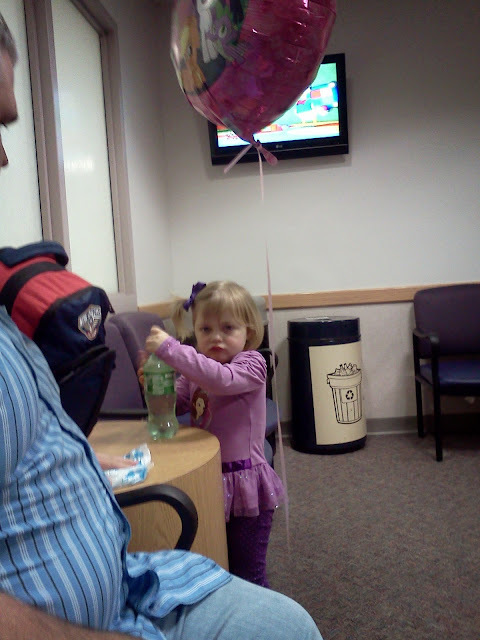 We had to bribe her with a balloon in order to get her to stop crying. She knows exactly what to do to get her way.